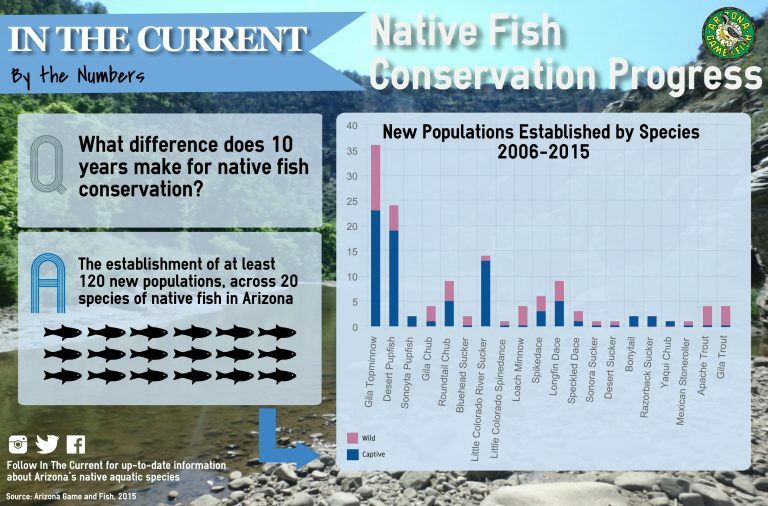 Arizona Game and Fish Department is the leader in the state when it comes to on the ground actions to protect and proliferate native species. In the last 10 years at least 120 new wild and captive native fish populations were stocked, and over 100 new sites for Chiricahua Leopard Frogs. Range and current distribution data is collected throughout the state for all native aquatics. In addition to stocking native aquatic species into their historic range the Department is actively managing designated waters for native species; including removals of non-native fish such as Green Sunfish, Mosquitofish, Bullfrogs, and Smallmouth Bass; habitat restoration and creation; and barrier construction.